Nesting dog beds or dog caves are also known as hooded dog beds. These enclosed dog beds have a design that creates a cave-like environment that helps dogs feel warm and protected. These types of dog bed caves have plastic bars or other support systems that keep the opening wide enough so a dog can easily get in and out. Nesting cave beds are best suited for dogs that like to burrow, dig and tuck themselves in enclosed spaces. This behavior dates back to wolves that often found shelter and warmth in caves. Due to their enclosed design hooded beds provide a sense of comfort and safety that help anxious dogs relax and feel at ease. And even if you don’t have an anxious dog, a cave bed can be a great option if your pooch likes to snuggle and burrow under layers of blankets. Or you can get a hooded bed if you have a pup that likes to squeeze in tight spaces or sleep under the table. If your dog prefers nesting and sleeping in enclosed spaces consider getting him one of the best nesting dog cave beds. This way he will feel safe and warm without pulling all the covers from your sofa bed. 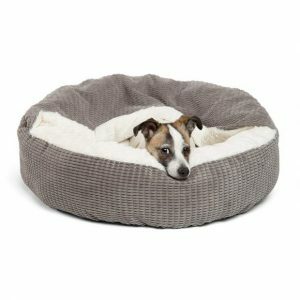 What to Look for In a Dog Cave Bed? The Snoozer Luxury Cozy Cave is a hooded bed that sports a thin plastic rod that allows for an easy entry. The inside of the cave is covered in sherpa fabric, and the base is made of cedar/poly mix for extra comfort. This bed also has a hidden zipper on the back which allows you to remove the base and wash the entire bed in the washing machine. Furthermore, the plastic rod is easily removable and you won’t have troubles placing it back. The Snoozer Cozy Cave comes in more than 40 different colors and 3 different sizes. The large option is 35L x 35W x 8H inches and can house dogs that weigh 55lbs or less. Most owners find that this cave bed works great for dogs who like to burrow and nest under the blankets. However, some owners say that the hole is too small and that the plastic rod doesn’t hold the entry up as it is supposed to. The opening is too small. Fleece lining can become worn over time. The Milliard Premium Plush Cave is made of soft velvet material and features a removable pillow. The cave is equipped with a non-slip mat, which provides stability and ensures that your pet feels safe inside the bed. Since there are no plastic rods this cave is completely foldable and suitable for travel. Furthermore, the entire bed is machine washable and won’t lose its shape if properly maintained. This cave is specially made for smaller pets and has dimensions of 12L x 14W x 14H. Thus, check to make sure if it is big enough to house your dog comfortably. According to reviews, this cave works great for nervous pets that seek a warm place to hide. Pets that like to snuggle and nest find this cave very comfortable and are sleeping only in it. However, some owners find that the cushion isn’t padded well and not so comfortable. Furthermore, the cave is really small so double check your dog’s measurements. Easy to store and pack. Slip-on mat for extra stability. The pillow isn’t fluffy enough. Comes only in small size. 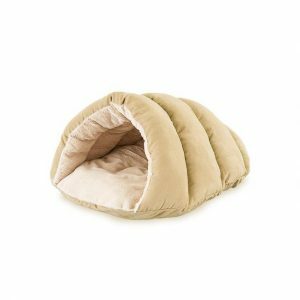 The Cuddle Cave by Ethical Pets is made of polyfill interior and faux suede exterior. This bed doesn’t have a plastic rod that holds the door open and is completely made of fabric. Since there is no interior tube the whole bed can be safely placed in the washing machine. Furthermore, this cave comes in a variety of different colors and its fashionable design will fit nicely into any home. The Cuddle Cave is suitable for dogs up to 10 lbs and comes only in two sizes. It is specially made for pooches that like to burrow. Unfortunately, this cave is just too small to house even medium-sized dogs. According to reviews, some dogs figured that they can sleep on top of the cave when it is too hot to burrow inside. Hence, you might get both bed and a nesting cave in one product. Since the door isn’t reinforced with a plastic tube, you may need to show your dog how to get into a cave a couple of times. Furthermore, some owners observed that the cave doesn’t hold its shape properly. Only for dogs under 10 lbs. Loses its shape over time. This cave is fitted with a heavy-duty zipper that allows you to remove the cover and wash it in the machine. This cave comes without a plastic rode so the door isn’t well defined and can serve as a blanket for your dog. You can also remove the top of the cave and get a round bed if it is too warm for your dog to burrow inside. The HappyCare Textiles also incorporated a non-slip mat for extra security and stability. This pet cave bed is made for dogs who like to burrow and nest and most owners like that the top isn’t reinforced and can serve as a blanket. Since the entry isn’t reinforced you will have to teach your dog how to get into a cave. On the other hand, some owners weren't pleased with the shape of the door and the fact that it doesn’t stay up. A cave and a bed in one. The top can serve as a blanket. Furhaven Burrow Dog Bed has a base that is made of certified polyurethane foam. The interior of the cave is made of faux sheepskin material that is comfortable and soft to sleep on. The top of the cave is reinforced with a plastic tube that allows it to be completely shapeable according to your dog’s needs. Furhaven also included a heavy-duty zipper, making the cover removable and easy to keep clean. This bed features orthopedic foam, which will help your dog rest comfortably and minimize the strain on his joints. This cave measures 35L x 35W x 3.5H and is designed to fulfill a dog’s burrowing and nesting needs. Most owners love that the plastic tube can be removed and that the top can serve as a blanket. The cave is also strong enough to sustain damages from most enthusiastic burrowers. However, some owners weren't pleased with the quality and state that the bed is too flimsy. Has orthopedic foam on the base. The top can also serve as a blanket. Great for dogs who like to burrow. Unlike other cave beds, the Best Friends by Sheri Cozy Cuddler features a soft blanket instead of a real top for extra security and warmth. The interior is made of soft faux fur material and the exterior is covered in corduroy. This cave has a flexible design that allows dogs to burrow, nest, and sleep in any position they like. Furthermore, soft walls provide extra comfort and can act like a head pillow allowing for a better sleeping position. The Cuddler Cave comes in two sizes, small that is appropriate for dogs up to 25 lbs and medium size that house pets up to 35 lbs. The bottom is reinforced so it resists water and dirt and the whole cave is machine washable. This cave can be a great choice if you have a puppy that is prone to potty accidents or older dog that has troubles moving. Most owners love this cave since it features a blanket that keeps the dogs warm during cold days. Some owners state that the material is flimsy and easily damaged during washing. Comes with a soft blanket. Keeps chilly dogs comfortable and warm. Soft sides work as a pillow. Can be damaged during washing. The bottom stuffing easily flattens out. •Soothes nervous and anxious dogs: The narrow and confine design of a cave bed helps fearful dogs to feel protected and at ease. Anxious dogs can be afraid of any number of things, and the cave-like structure gives them a them a sense of security from any dangers in the environment. •Alternative for a dog crate: Dogs who enjoy sleeping in crates also love snuggling in nesting beds. Hence, if you are spatially impaired or don’t want to keep a big dog crate in your living room, a cave bed can be a great alternative. 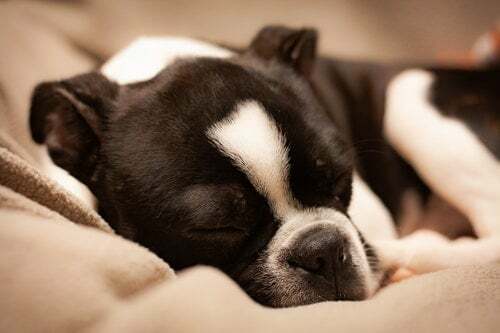 •Colder climates: The closed in design of cave burrowing dog beds enables them to preserve warmth more efficiently than regular dog beds or mats. And during cold winter nights, a shorthaired dog can benefit from extra warmth that will keep chills at bay. 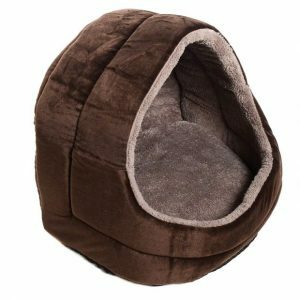 •Size: Too large of a dog cave bed will annul all the sense of safety and coziness it is designed to provide to your dog. Hence, measure your dog carefully and double check his measurements against ones provided by the manufacturer. •Easy to maintain: Many hooded beds sport machine washable covers and pillows. However, some can only be spot cleaned or vacuumed. So, consider how dirty your dog can get and how hard it will be to clean the bed. •Durability: Cave beds are made of different materials, but they need to be sturdy enough to sustain occasional chewing or clawing. Furthermore, the bed should be durable and able to sustain occasional washing without losing its shape. 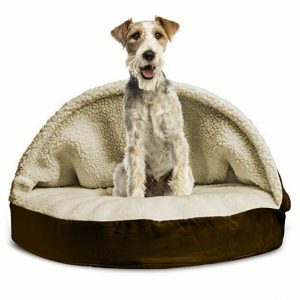 •Support: If you have an older dog you should look for a cave bed that has an orthopedic pillow. This way his weight will be spread evenly keeping him comfortable and preventing joint pain. If your dog likes to burrow and hide under the blankets then he would enjoy sleeping in one of the best nesting cave dog beds. Cave beds have an enclosed design that makes dogs feel safe and comfortable. Furthermore, these beds retain warmth better than regular dog mats and are great for cold winter days. 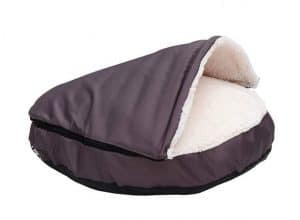 We recommend Snoozer Luxury Cozy Cave Pet Bed as the product that offers the best value for its cost. This cave comes in three different sizes, more than 40 different colors, and has a removable plastic rod. This bed is machine washable once you remove the rod and the base filling. Since the doors are large enough your dog will have enough space to burrow and dig inside the cave and set it according to his preferences. Furthermore, the sherpa fabric will keep your dog comfortable and warm while he naps or rests. With so many different types of dog nesting caves available there is no need to ignore your dog’s instincts to burrow and nest. Instead of leaving him to dig and hide under your blankets get your dog a cave bed that will indulge his basic needs and allow him to feel safe.